Motorists in a flood-hit town have been risking their lives by using a bridge which is in danger of collapsing. 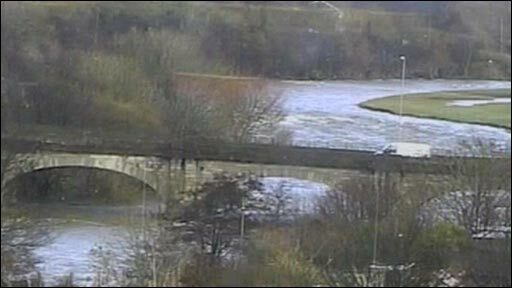 Calva Bridge in Workington has been closed to traffic since it was damaged by floodwater. However, three vehicles were spotted driving across it on Thursday after occupants removed temporary barriers. The loss of bridges in Workington has cut the town in two, but it has been confirmed a temporary footbridge will be built by the army. Cracks have appeared in Calva Bridge and the structure has become increasingly unstable in the past week. Temporary barriers and signs are already in place, but highways staff will now install motorway-style barriers to reinforce the blockade. People have had to make long detours after the collapse of two other bridges spanning the River Derwent, which splits the town. Pc Bill Barker died when Northside Bridge caved in, causing him to be swept away in the floodwater. The Prime Minister was one of a number of people to pay tribute to the father-of-four, who he said died "trying to save the lives of others". 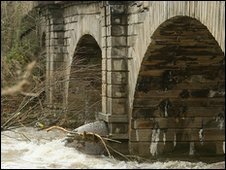 Engineers are continuing to explore options on road connections, but in the meantime work is to begin on installing a temporary footbridge upstream of Calva Bridge. Up to 200 soldiers will work in shifts around the clock, with foundations due to be in place by 29 November. Then the bridge, which is being transported in sections, will be assembled and dropped into place, and there are hopes it will be open to the public by 5 December. The funding has come from the government's recovery package for the flood-hit area. Councillor Jim Buchanan, leader of Cumbria County Council, said: "Our highways engineers have been pulling out all the stops and working with the army to make this happen as soon as possible. "It's vital that we get people moving and able to cross the river." The military effort is being co-ordinated by the regional Brigade for North West England, 42 (North West) Brigade. Brigadier Bill Aldridge said: "The Army is very much part of society and part of the fabric of Cumbria where my Brigade is based, and we are determined to do what we can to assist in the recovery from these devastating floods."